Everybody loves our Sugar Babies!. They're smaller than their premium sized sisters, but they're every bit as sweet, juicy and definitely fun to peel and eat. Perfectly sized for kids....and grownups too! 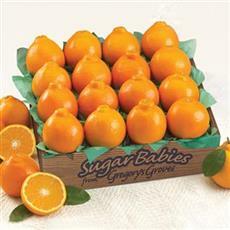 Sugar Babies are a family of sweet-fleshed oranges that are smaller than most orange varieties but that carry all of the flavor of their bigger cousins. 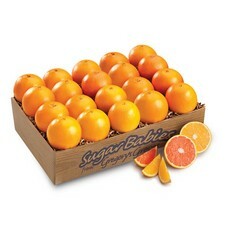 Sugar Baby Navels — Hand picked at the peak of their ripeness - is anything better than a perfectly ripe Naval Orange? Yes, a perfectly ripe Sugar Baby Navel Orange. Available in 20 or 40 count flats. Sugar Baby Honeybells — These pint-sized Tangelos pack in all of the flavor of their big cousins with the same easy to peel rind that people have fallen in love with for ages. Give the vitamin C packed little wonders to families during flu and cold season, as a snack for grandkids, or as a thank you gift for everyone else. Sweet, delicious, and pint-sized. Sugar Baby Rubies — This is the smaller version of the Ruby Red Navel that holds all of the brilliant flavor and sweetness and that beautiful red flesh that is so unexpected in oranges. These make the perfect gift or the perfect treat for yourself. Available for limited time only. Sugar Baby Honeybell Deluxe — The deluxe package of Sugar Baby Honeybells includes those wonderful little baby Honeybells and two 3 oz. jars of Honeybell Marmalade. As if this arrangement could not get any better, Gregory's threw in 4 oz. of creamy coconut patties in the same gift box. What a way to treat someone you love. Sugar Baby Honey Tangerines — Available in limited supply, these Sugar Baby Honey Tangerines are yellow rind and full of amazingly sweet flavor. Get them while they are available cause it will be next year before we see these again. Sugar Baby Valencia Oranges — Valencia Oranges are one of the best oranges available and they have been outdone by these smaller Sugar Baby Valencia Oranges. Beautifully orange, juicy, and full of sweet, delicious goodness. Sugar Baby Temples — Nothing says spring like a perfectly ripe Temple Orange except a whole flat of Sugar Baby Temples picked at the peak of ripeness. Available in flats of 20 or 40 Sugar Baby Temples. 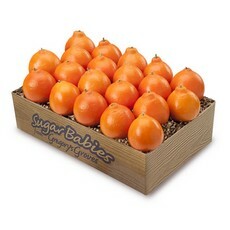 Sugar Baby Bells — A perfect pairing between a Honeybell and Clementines are these sweet little Sugar Baby Bells. Sweet, small, and packed full of flavor, these little beauties are available earlier and go quickly. 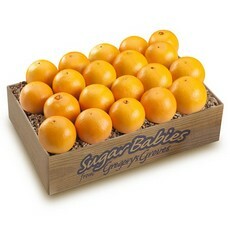 Sweet Sixteen Sugar Babies — are a unique offering from Gregory's that include sixteen Sugar Baby Honeybells. 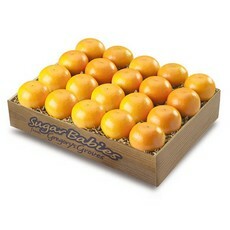 This easy to share flat of Sugar Baby Honeybells makes a perfect gift for families and the easy to peel sugar baby fruit is perfect for children and adults. Along the same line are Tangerines, Christmas Tangerines, and other small orange fruit. 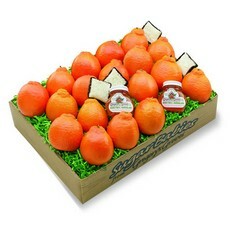 The Sugar Baby Fruit makes awesome gifts and a perfect thank you for people you love. Get them while supplies last as many are only available in limited supply.